• An issue with the Edge Browser with Application Guard cannot be opened when Surround is enabled has been fixed. • An issue with the Blue screen crash which occurred when exiting games when using G-Sync monitor has now been fixed. • Users complained of Stuttering which occurred with HEVC video playback. This has now been fixed in the latest driver update. • Pausing the Audio playback made the audio receiver switch from multi channel to stereo. This issue has now been fixed. • An issue with the AV receiver switching to 2-channel stereo mode after 5 seconds of audio idle has been fixed. • Issues were reported when users tried to Record and stream NVENC applications not working. This has now been fixed. • In Direct X11 games the mouse cursor causes FPS to go out of sync with windowed GSync. This has now been fixed. • NVIDIA improved the game stability of ARK Survival and Shadow of Tomb Raider. The flickering issue during gameplay for Witcher 3 Wild Hunt and Far Cry 5 has now been fixed. • Single GPU response slows down after enabling/disabling SLI, requiring a system reboot. • You will notice Random DPC violation error when using multiple GPUs on motherboards with PLX chips. • When the HDR is enabled, the display turns pink after changing from 144 Hz to 120Hz in-game settings. • Firefox users will notice issues with the Cursor when hovering on certain links. • For Win7 and Win8.1 users, Intermittent G-sync will not disengage after exiting games. • You would notice the slow down of the Single GPU by about 10% after enabling/disable SLI until PC is rebooted. • While playing Fallout 4 you will come across a crash to desktop during gameplay if Weapon Debris is enabled on Turing cards. It is highly recommended you to go through the list of known issues before installing the driver update. 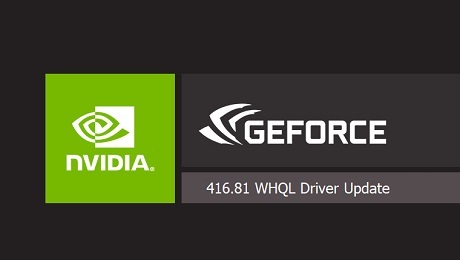 You will be able to download the 416.81 WHQL-certified drivers via the GeForce Experience app on Windows.